Phillip Mimoso a.k.a. 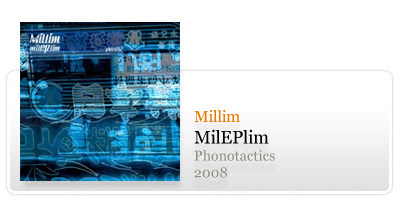 Millim is a Portuguese Canadian citizen living in Montreal (Canada), who's been making music since 1995... From beats to soundtracks to soundscapes, nothing can stop his exploration of new sounds and ideas. Do not be fooled by the introduction track where Millim explores the hop beats in a hip oldschool glitch style, because in the next tracks the dish is more strong: great jungle beats merged with some space bass synths and even violins can be heard everywhere, synchronized in a proper warping style. This four track EP of is a well done presentation card of this producer who now joins the phonotactics catalog. I can guarantee that after you listen to these tracks, you will want more... but for now that's all folks"